We received the sad news of the untimely passing of Dr. Daniel Sena of Dallas, Texas on Friday, August 31, 2018. 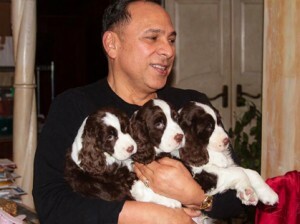 Dr. Sena was a longtime breeder and exhibitor of English Springer Spaniels under the Dansen prefix. He was also an up and coming AKC Judge of nine Sporting breeds. Professionally, he worked as a dentist based out of the Dallas area. Most importantly, he was a friend and mentor to many. The Canine Chronicle extends our sincere condolences to his many friends and family during this difficult time. He will be missed. Posted by chesliepickett on Sep 4 2018. Filed under Breaking News, Featured. You can follow any responses to this entry through the RSS 2.0. Both comments and pings are currently closed.